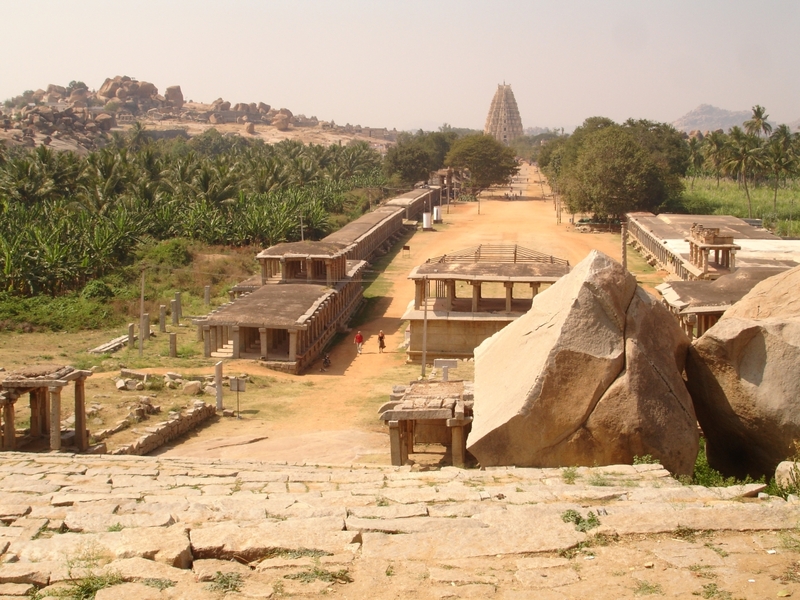 Virupaksha temple is one of the most visited temples in Hampi. The Hampi tour is incomplete without a visit to the Virupaksha temple. The Virupaksha temple in Hampi gets a large influx of tourists and pilgrims due to its religious, architectural and historical importance. It is an ideal landmark to start the Hampi tour. "Virupaksha" is a form of Shiva. The name "Virupaksha" means one with oblique eyes. The most striking feature of Virupaksha temple is its 50feet tall Gopura(tower) located at the west end of the broad Hampi bazaar. 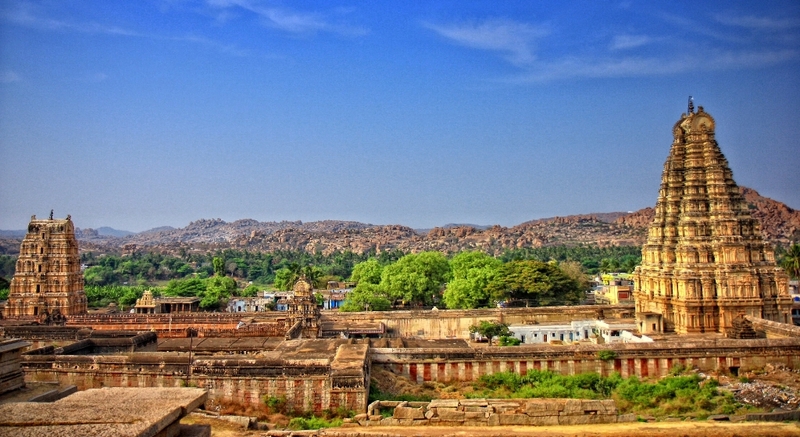 Hampi Bazaar was a prime market place in the ancient Vijayanagara Empire. As the Vijayanagara Empire fell in the late 16th century the Bazaar also lost its magnificence. However in 1950s the Bazaar was rejuvenated when a rest house was built here. Many shops, restaurants and residential structures then sprouted in the Hampi Bazaar which concealed the colonnades (a row of evenly spaced columns supporting a roof or a corridor) and shrines of Vijayanagara period. Recently the Hampi Bazaar was demolished by the government as a step to protect the historical shrines; sadly the local merchants lost their place of trade and living. At the west end of the Hampi Bazaar, the Gopura of Virupaksha temple is located. It is an imposing structure in white color which serves as the prime entrance into the temple. Though the origin of Virupaksha temple dates back to 7th century, the main Gopura is a relatively new structure. Even though the name of the patrons are not known, the Gopura has undergone major restructuring in the 19th century. The Gopura has gradually diminishing 9 stories and is beautifully carved with mythological figures. It ends in a pointed Kalasa top. This Gopura leads us into the first courtyard of the Virupaksha temple complex. It is a spacious courtyard with a brick colored Mantapa (Pillared platform) on the south west corner. It is supported by 100 pillars and was built by Krishnadevaraya in the 16th century. The Mantapa is designed as three ascending levels, and leads into a spacious inner hall which is adorned with intricately carved pillars. There are not much to see in the first courtyard apart from the Mantapa. One can enter into the second courtyard which is accessible via a smaller tower of 3 stories. 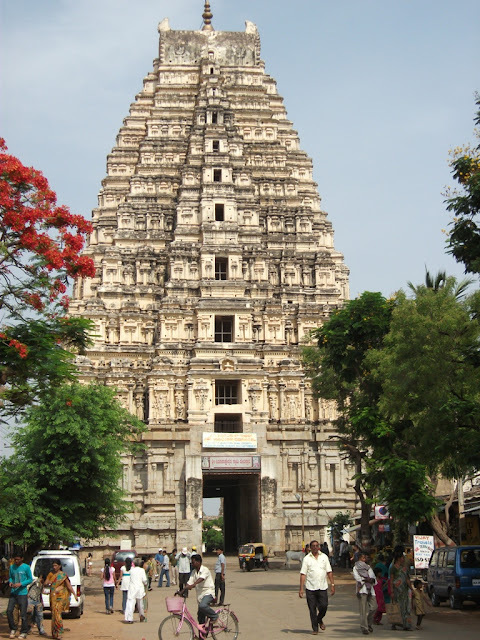 Unlike the main tower of the temple, this three level Gopura is of typical Vijayanagara style. This Gopura was made by Krishnadevaraya as a part of the temple expansion activities conducted on the occasion of his coronation. 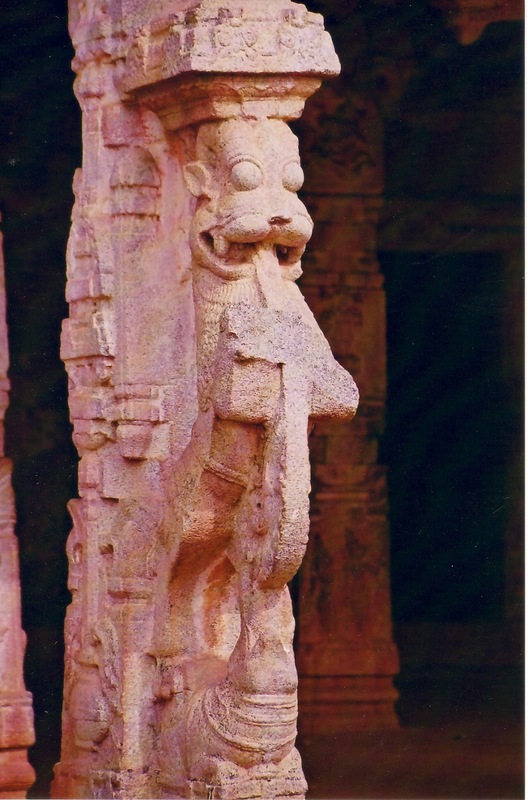 Pampa and Virupaksha were the guardian Gods of Vijayanagara, hence every king who ruled Vijayanagara tried to expand and adorn the temple. Passing through this smaller Gopura, we enter into another courtyard which has a Deepa-Sthamba ( Lamp Post), a Nandi pavilion and a small shrine standing in the middle of the courtyard. On the western side of the second courtyard we find a central pillared hall known as the “Ranga Mantapa” constructed by 1510 AD by Krishadevaraya. 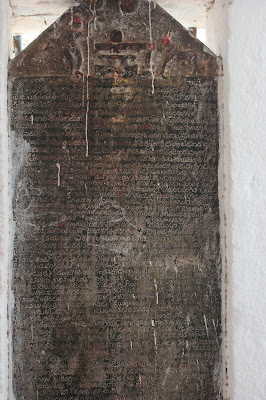 The details of which are inscribed on a stone slab in front of the Mantapa. 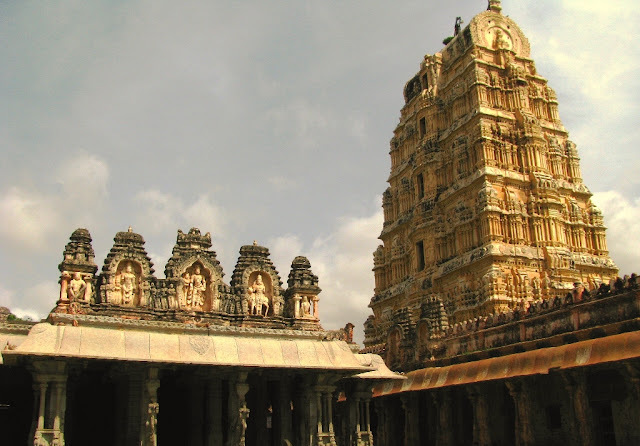 The “Ranga Mantapa” of the Virupaksha temple in Hampi holds a very important place in the Vijayanagara history. It was in this grand hall where the legendary king of Vijayanagara – Krishnadevaraya was crowned. As we climb the steps of Ranga Mantapa, the first thing that strikes anyone is the beautifully carved pillars. The structure of the pillars is quite exquisite. The pillars feature a mythical creature known as “Yaali”. The Yaalis have a fierce appearance with its protruding eyes and fangs. They stand with their front paws raised, as if to explode into action. The stand on top of another mythical creature known as “Makara”. “Makara” stands for fish in Sanscrit, however the animal featured on the bottom part of the pillar is nothing less than an aquatic beast. As we move to the interior of the Ranga Mantapa, we see sixteen pillars similar to the external part of the Mantapa. A close observer can note a slight difference in these pillars. With contrast to the pillars outside, these pillars have riders on top of the Yaalis. The central sanctum of the Virupaksha temple is located at the end of this pillared hall. 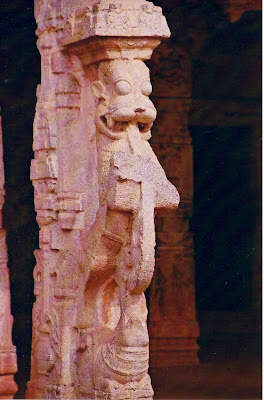 One of the striking feature of the Virupaksha temple in Hampi is it's murals. The roof of the Ranga Mantapa is adorned with murals that features the marriage of Pampa and Virupaksha, Rama and Sita. Another mural depicts Kaama aiming arrow at Shiva in meditation. Another interesting mural on the roof is that of Vidhyaranya- the spiritual Guru of the founders of Vijayanagara Empire- being carried in palanquin. Experts suggest that some of these painting cannot be more than 200 years old based on the costumes and weapons features in the paintings. These painting might have been originally from Vijayanagara period but have extensively retouched during the 19th century. The central sanctum of the Virupaksha temple houses a "Mukha-Linga" which is a Shiva Linga with a brass embossed face. The central sanctum of the temple has also undergone major structural and style remakes during the recent centuries and cannot be completely attributed to the Vijayanagara period. There are two smaller sancta to the North of this central sanctum which houses Pampa and Bhuvaneshevari- the consorts of Virupaksha. These sancta are quite antique and comparatively untouched by the later renovations. There are other smaller sub shrines of Mahishasure Mardini and Adishesha near the main sanctum. Once we exit the Ranga Mantapa or the coronation hall, we can spent sometime admiring the beautifully carved pillared corridors (colonnades) running through the north and south sides of the inner courtyard. on the Northern side of the central sanctum, we can find another Gopura leading to the Manmatha tank. this is called the "Kanakagiri" Gopura by the local population. 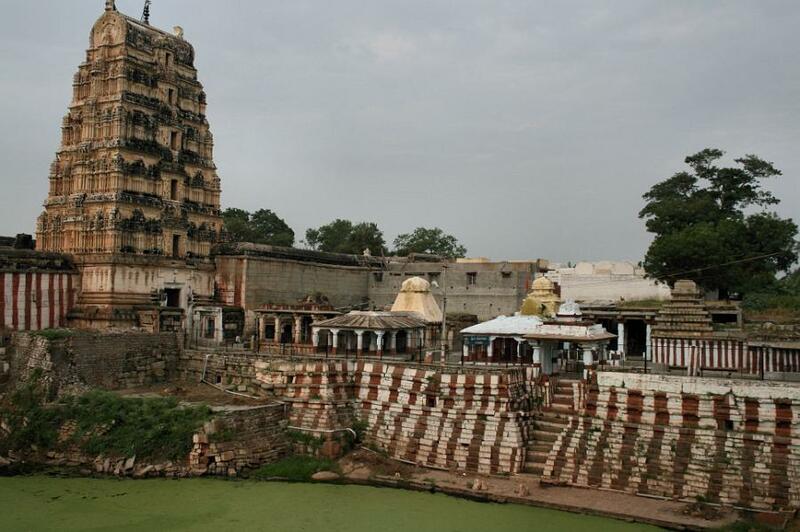 Manmatha tank is the main water body associated with the Virupaksha temple in Hampi. Sadly, it is in ruins now. Nevertheless, the small shrines that are located on the bank of Manmatha tank is of utmost historical importance. It is easy to miss these but it would be a hell of a miss! There is a Durga Devi shrine which dates back to the 9th century Rashtrakuta style. An ancient slab tablet dated 1199 can be found near the entrance of this shrine. It describes about the Pampa- Virupaksha worship, which is the earliest record of the same. 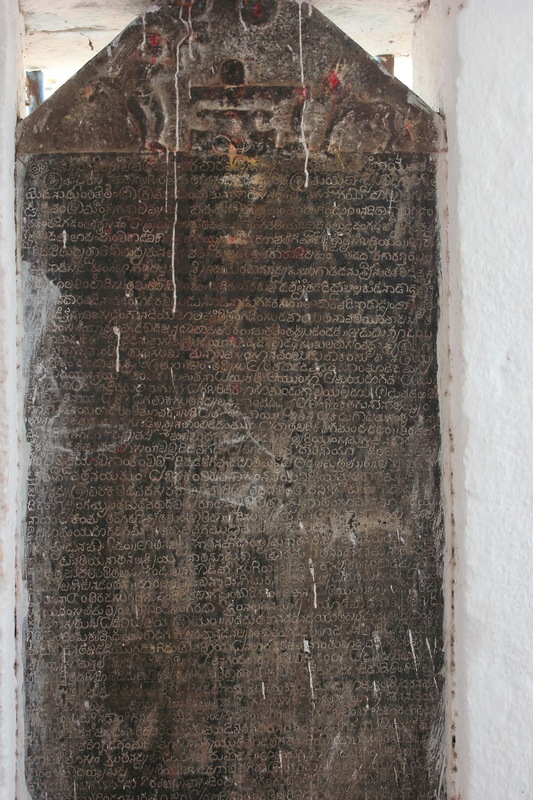 From this inscription, it becomes evident that the religious cult of worshipping the Virupaksha-PampaDevi couple existed much before the Vijayanagara period. The Vijayanagara rules must have just followed the tradition of the region. 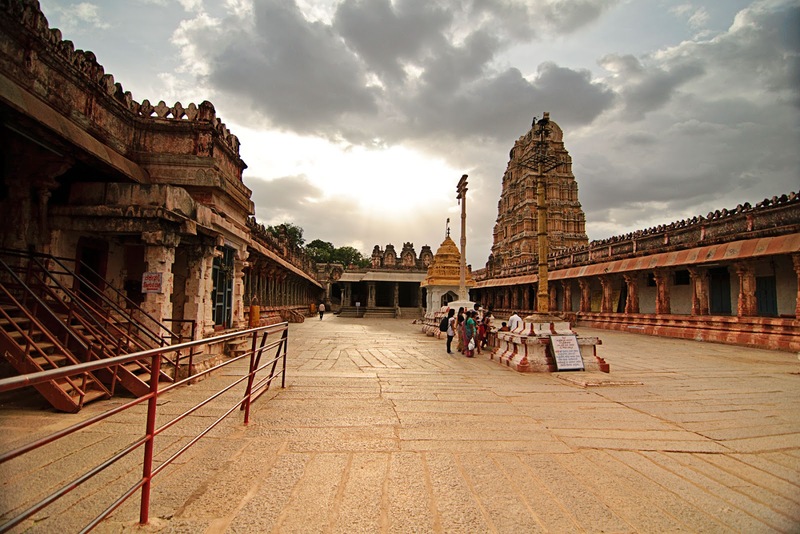 Virupaksha temple in Hampi opens for regular prayers in the morning and evening. The sanctum would be closed around the noon time, however one can enter into the temple all day throughout by buying the ticket from the first courtyard. The first stop of the Hampi tour comes to an end at the Virupaksha temple. 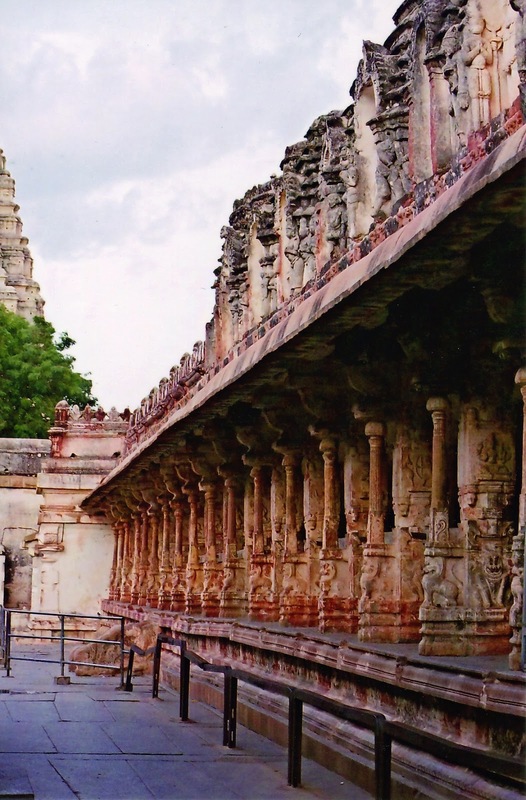 Planning a trip to Hampi and stubbled across your blog. Great pictures and good information that you have shared. Thanks!